KIEV, Ukraine -- A German consumer goods company has withdrawn a brand of toilet freshener from sale in eastern Europe after Ukrainians complained that it resembled their national flag. 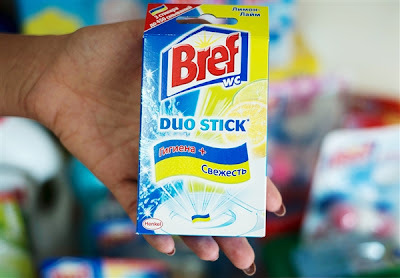 A television advertisement for the yellow-and-blue Bref Duo Stick freshener, caught the attention of Ukrainians after it was aired on Russian television, which is watched by many in the neighboring ex-Soviet Republic. The ad shows the freshener - a rectangular-shaped block - is put under the toilet rim. "A delirious idea from uncultured people," one person commented on the YouTube clip. Tore Birol, Henkel's general manager for laundry and home care products in Ukraine, told Reuters on Wednesday the company had pulled the product within three days of seeing the complaints. "We are very sorry if people were offended by the design of our new product," he said. "We stopped the production, distribution and television advertising (of the product)." Birol said the freshener, which had been marketed in central and eastern Europe but not in Ukraine, was colored yellow to represent its lemon scent and blue to symbolize water and hygiene. Misuse of state symbols became a sensitive issue in Ukraine earlier this month, when the authorities found that Jared Hasselhoff, a bassist for American rock band Bloodhound Gang, had urinated on the Ukrainian flag during a gig in Kiev. Ukraine has since launched a criminal probe against him and barred the musician from visiting the country for five years.